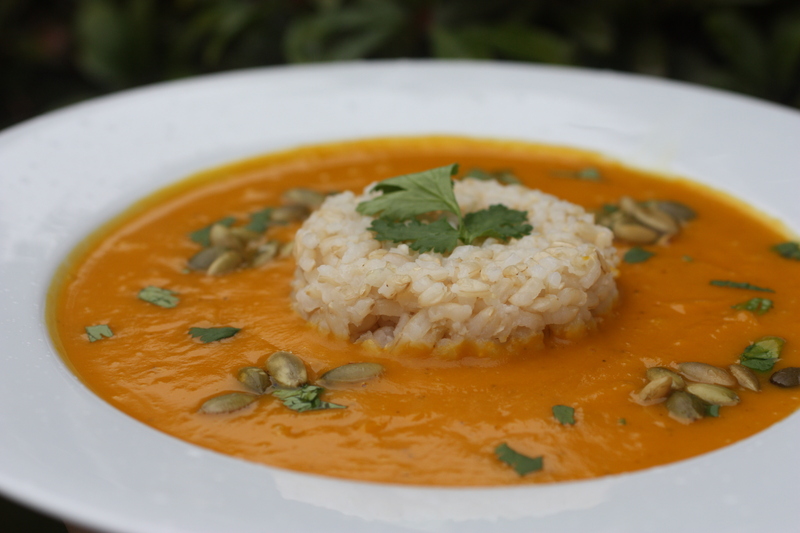 Butternut Squash and Sprouted Brown Rice Soup - myWholeLife. Do you know the top 3 types of foods that can help you manage your weight? For a detailed list of weight management foods you should incorporate into your daily routine download our Weight Management App Today! 1In a large saucepan, heat the coconut oil, add the onion and garlic and cook for 5 minutes. 2Add in the squash, ginger, turmeric, coriander, sea salt and pepper. Continue to cook for another 2 minutes, stirring. 3Add in the vegetable broth and simmer. When the squash is tender, puree the soup with a handheld blender. 4Press a ¼ cup of cooked rice in a small bowl or cup to form, place upside down in centre of your soup bowl then pour soup around the rice. 5Top with cilantro and pumpkin seeds then serve. Rinse and drain the brown rice. Place the rice and water in a pot and cover with a lid. Bring to a boil, reduce heat and simmer for 40 - 50 minutes. Fluff with a fork and serve.